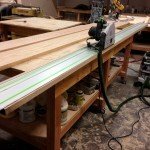 Straight lining long Oak board for milling ..Large production mill shops have special , expensive machines for this . Small shops like mine do not have the room for some of these industrial equipment .. So , you get a Festool track saw that can cut almost 3 inches deep without hesitation.. No complaints..